"Do you see the story? Do you see anything?... It seems to me I am trying to tell you a dream - making a vain attempt, because no relation of a dream can convey the dream sensation... No, it is impossible; it is impossible to convey the life-sensation of any given epoch of one's existence - that which makes its truth, its meaning - its subtle and penetrating essence. It is impossible. We live, as we dream - alone." Marlow in Heart of Darkness, Joseph Conrad. Could you tell that this song was inspired by the story of ‘Puss in Boots’? Do hope this gets you whistling along to this catchy tune! The trio only had 1 short practice session for this, so I hope we did a decent job. Don’t forget to like this video, and subscribe to us for more. Sharing our first HTLxSSENZE dance cover, did we get your hearts going Bboom Bboom? Thank you to our amazing videographer, MarvinPD님 (Myeyecandies) for taking time out to recreate this. Perhaps without these girls my life right now would be rather boring and meaningless. Took a short hiatus from dance but jumped right back at it because there’s no way I can really stop. This song was originally sang and performed by BLOCK B. All rights belong to the respective owners. No copyright infringement intended. I had the pleasure of reviewing A Better Florist- Singapore’s most innovative florist. I like to get my facts straight, so I dove in deep into research mode. I started by visiting their social media and website. Right off the bat, I could see why so many people refer to it as best florist in Singapore. There it was; a heaven of flowers. Picture after picture of gorgeous, fresh and vibrant blooms, just staring at me, begging me to order them. I was delighted with what I saw. Their designs are unusual and authentic, and it really shows that their florists know what they’re doing. I enjoyed scrolling through their selection on the website. It was short and sweet. Each arrangement and bundle had a cute name, a short description and the price listed right beside it. It’s very convenient and easy to make a choice, especially if you’re looking for something special for Valentine’s Day flower delivery in Singapore. This flower shop started out as a typical flower stand Singapore is used to seeing, and it developed into a great flower business, that really stands out. All of their flowers seem so fresh, and there’s a reason behind it. They grow their blooms on a farm on Cameron Highlands, and once they are ready, they are delivered straight to their flower shops. This makes them fresh and long lasting. If you ask me, when you pay for flowers, you want to have them around for as long as possible. By that time, I was convinced that it was the best florist in Singapore. And then, I read about the best flower delivery in Singapore. A Better Florist took it yet another step further, and made their delivery super-fast. You can order right now, and they will deliver it on the same day, within only 90 minutes! That’s a truly outstanding service and I applaud them for their idea of being the only 24 hour florist in Singapore. That’s something Singapore never experienced before, not when it comes to flower shops. There’s no doubt a cheap bouquet Singapore florist can craft is something that we’re used to, but A Better Florist has the ideal balance between crafting luxurious blooms and still keeping the prices affordable. Naturally, I wanted to find out more. I wanted to see what others had to say about them, and whether they are as popular as they seem to be. I was later surprised to find out that they are also well known beyond Singapore. They are considered the best florist in Hong Kong and the best florist in Dubai and Abu Dhabi, by several reputable sources. This information came in handy, because I love to travel. And, if I can depend on the best flower delivery in Hong Kong like I do in Singapore, why not? If you’re looking for a Dubai flower delivery and Hong Kong flower delivery, make sure to track down A Better Florist. I would be glad to see their flower chain expand to the entire world, since they really did surprise me, and I highly recommend it to all. Not just travellers, but all the people who get the chance to experience all that A Better Florist team has to offer. I’m having a roaring good time cleaning out a writing folder filled with incomplete, half-assed fiction, themed articles on beauty, tech and health, as well as a bunch of incoherent poems, and God knows what else I might unearth. Painful as it is, the Recycle Bin is where they shall all go. I thought I might have written some gems, but really, most pieces are utter crap. I hate how I sounded five years ago. It was then that I used to contribute very short articles to a now-defunct e-zine for silver-haired folks, as well as a Japanese health and beauty site that has unfortunately gone the way of the dodo. Writing came to me rather easily then – it kills me that I’ve developed a lethal overthinking habit, and I can’t seem to write as quickly and smoothly now. I’m hoping to regain some writing mojo. To celebrate the purge of my writing folder, here’s a short one I wrote to supplement a campaign for healthier food choices for the older generation. Mind you this was five years ago. Join me as I cringe and watch this burn. Most of us battle sugar-addiction on a daily basis. When feeling tired, stressed out or just plain hungry, we reach for sugar-laden quickies – chocolates, icecream or a doughnut with our coffee. Bitter foods may not be appetising, but studies have shown that bitter foods stimulate our taste receptors on the tongue, increasing bile flow and nutrient absorption. Nutritionist dietitician Nicole Dube of Halifax, N.S. encourages consumption of bitter foods and herbs as “help to stimulate digestive juices and support food digestion.” Enhanced digestion of bitter vegetables leaves you feeling full and satisfied for much longer than that tempting bar of chocolates. Hate bitter foods? Here are some bitters that make excellent addition to soups and salads, and when sprinkled over pastas and pizzas, or stuffed in a breakfast wrap. With over 45 different flavonoids in kale being identified by researchers, its antioxidant and anti-inflammatory properties helps to relieve chronic inflammation and supports our body’s detoxification system. Chocked full of phytonutrients, endives support the liver by reducing cholesterol, and balancing our hormones. A member of the chicory family, sometimes known as asparagus chicory, the puntarelle is an Italian favorite that is low in calories and extremely high in vitamin C and B9 density. Fresh radicchio is one of the excellent sources of vitamin K. Increasing intake of vitamin K has an established role in treatment of patients suffering from Alzheimer’s disease, as it limit neurona damage in the brain. Lutein, the carotenoid found in spinach, prevents eye diseases such as age-related cataracts and macular degeneration. The next time you’re craving a sugary boost, think of the healthier bitter alternatives that are in fact, sweeter in the long run. Need further convincing to eat your bitters? Bitter greens like radicchio, endive, and kale contains phytonutrients that support the liver – the vital organ that stabilizes our hormones, purifies the blood and metabolizes fats. I mean, if some lady got to marry the Eiffel Tower, I can be legally tied to my bed so that it’s absolute cruelty to force us apart. It took weeks of sleep deprivation, and then a good sleep-in Saturday, for me to realise my greatest love is my own bed. And if my bed were all these kinds of pretty…I’ll never ever leave it for anything or anyone. Red Room. Hurhurhur…who else gets the reference? #randommusings on a Saturday night, before I return to worshipping my other half. Our first collaboration with the talented boys from FulloutSquad! 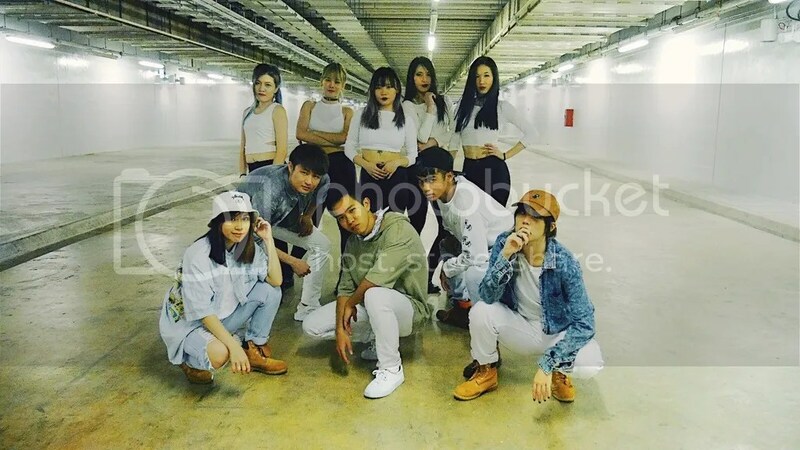 WINNER’s new song has been a big win for us so we tried our best to recreate their dance with a full cast. We’re also submitting this video for the WINNER x genie cover dance contest and would really appreciate your support + love! 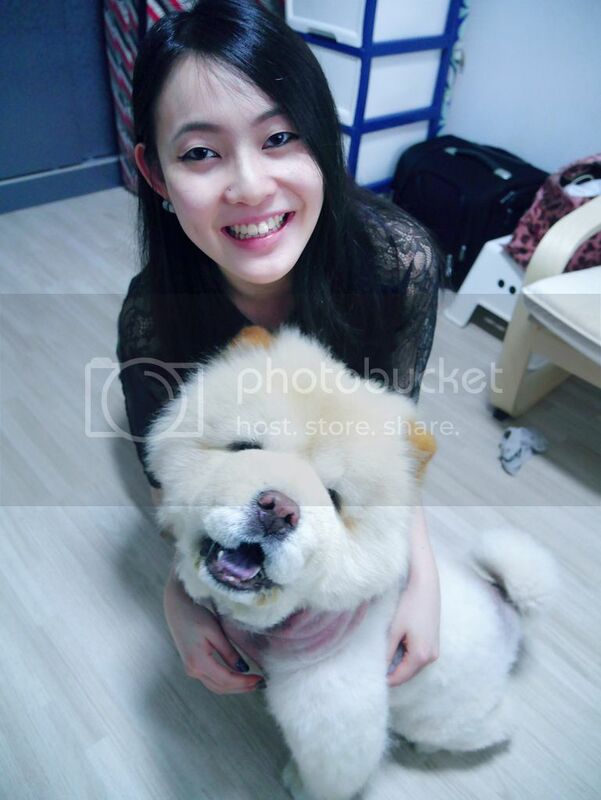 This song was originally sang and performed by WINNER (걸스데이). What’re you so scared of? Are you just gonna follow behind? We couldn’t resist the song when it’s so catchy. Heels are definitely not one of our strengths but you’ll enjoy our cover just the same! Subscribe and stay tuned for more coming your way! And also, our 6th collaboration with MarvinPD! Don’t forget to check out his facebook and youtube channel! Thanks to our ssenze fairies (Amanda, Youwen & Xingyi) for coming down to help with the music and lighting! This song was originally sang and performed by Girl’s Day (걸스데이). That’s the time I’ve been waiting. I have a sense of what you want. I’m not tired all night. I was drunk in your eyes. Do not go home. stay with me. I’ll lead you so baby come. I do not need any lights. our eye contact is enough. The sky is coming down on us. Swarovski Crystal Pixie nail art is the manicure industry’s best kept secret. It’s still popular in Japan and the States, but strangely this style is quite rare in Singapore. 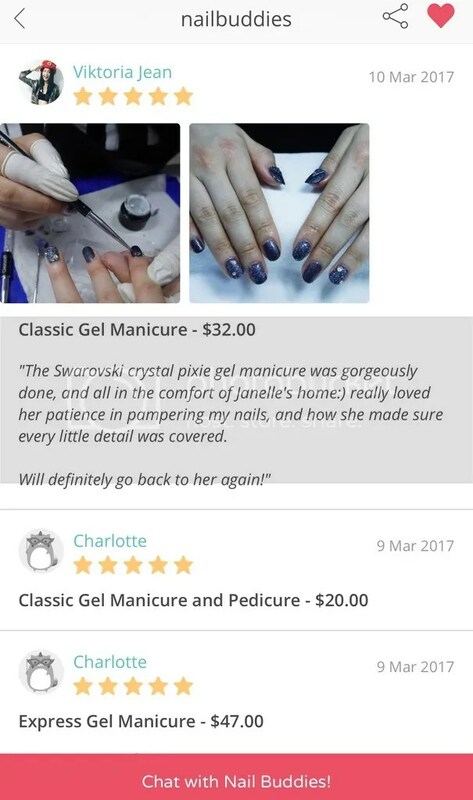 I have seen some gorgeous pictures on Instagram so I was really excited when Vanitee matched me up with a lovely manicurist, Janelle from Nailbuddies, who gave me a very rare Swarovski Crystal Pixie gel manicure! You may be wondering – what on earth are Swarovski Crystal Pixies? 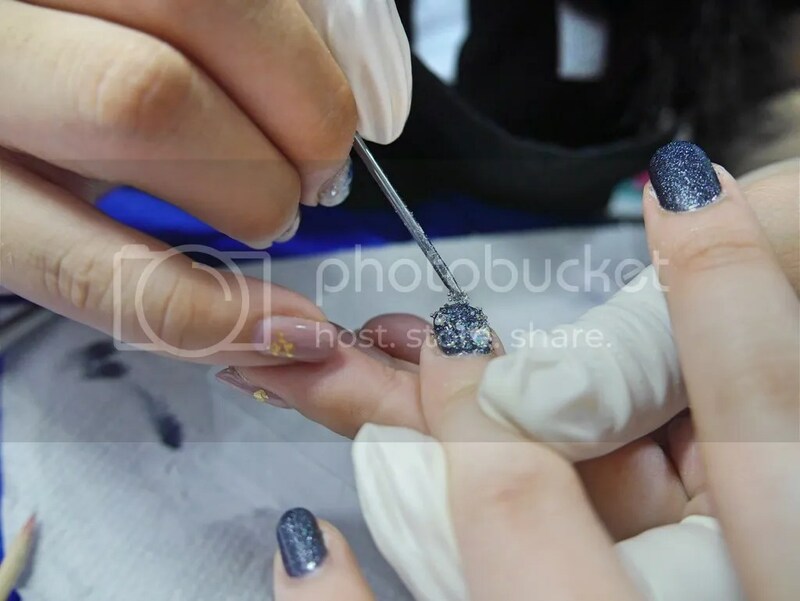 They are tiny round crystals mixed with other bullions, and serve as little pretty gems to adorn your nail art. So you may choose to highlight one finger, or bling out all 10 of them (thumbs included). I swear, they are much shinier, lighter and sturdier than your average plastic nail gems. After my experience, I decided to write this piece about 3 ways to wear the Swarovski Crystal Pixie Nail Art! Janelle has 2 types of this: the dark and light crystals. I chose to use the light ones this time, but it really depends on what base colour you choose, and which crystal will complement it best. Anyway, more about Nailbuddies! Janelle offers a convenient home-based service, so you may select from her range of available dates. If you’re an Eastie, her home in Tampines Street 84 (psst…please see the app for her full address) is just 3 bus-stops always from the interchange. If you’re lost, just give Janelle a direct ping in the Vanitee chat and she will give you directions! I arrived at Janelle’s place for the first time, and was invited into her spacious, private manicure haven. Her manicure workspace is so comfortable and I felt right at home. Plus Janelle is so chatty and friendly, I felt at ease being in a stranger’s room! Right away, I could feel her passion and expertise with the number of tools and gel bottles in her room. 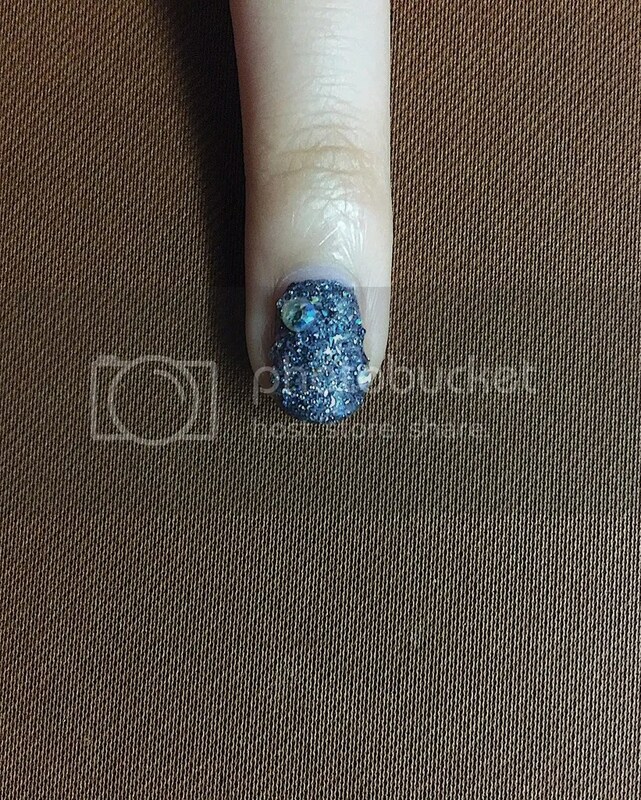 I picked the dark, starry midnight steel blue (which already naturally bling because I love glittery nails! ), and Janelle got right to work. First she patiently removed my DIY-ed gelish nails, then trimmed my nails into nice round shapes, before buffing and taming my messy cuticles. I applaud her skills! She really saved my ugly nails. Following the TLC, she gave my nails 2 layers of base colour. Then she takes out some very delicate skinny tools to begin glueing the Swarovski Crystal Pixies. So fascinating! I cannot emphasis how carefully she placed the crystals on my fingernails, and arranges them artistically. It’s like a surgery going on in here! 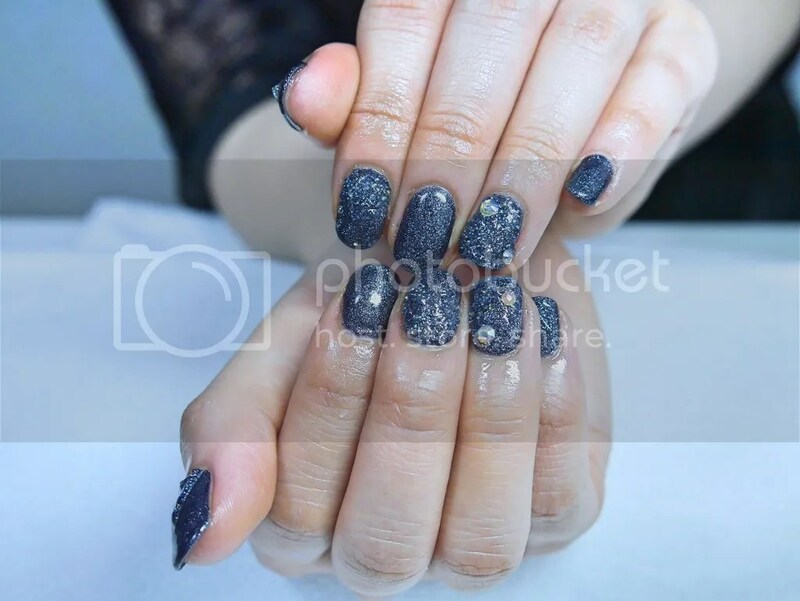 She actually pours the crystals onto the fingernails that require more crystals, as this gives a more even effect. So for your next nail adventure, why don’t you try these 3 amazing ways to wear the Swarovski Crystal Pixies? 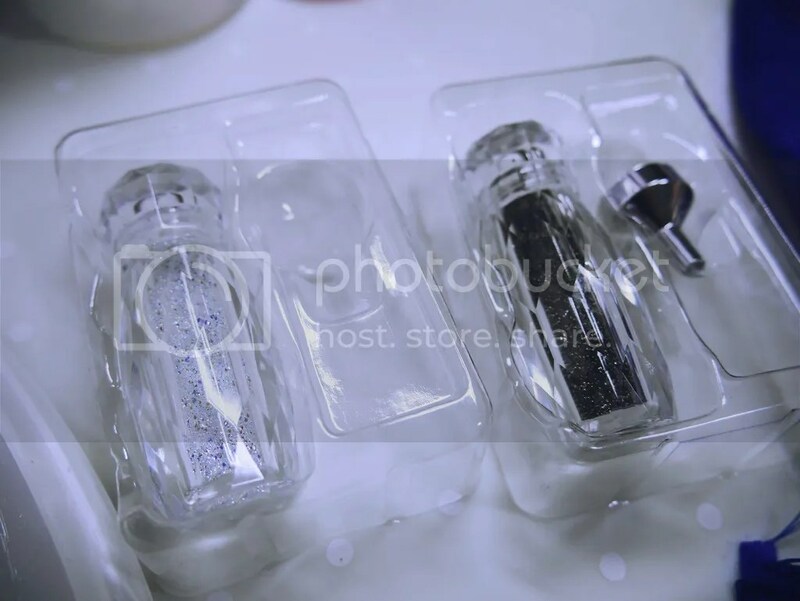 With a silver sticker strip, a triangle was first shaped, before filling it up with crystals. This is my personal favourite because of the endless possibilities! Yes shape anything you want. You will never get bored. If you’re looking to go over-the-top, Swarovski Crystal Pixies will be able to help. When paired with chunkier gems, the effect is crazy – I swear it’s the first thing people see when I wave to them, in the dark, 5 feet away. See how the bling-bling gems stand out in this full-manicure shot? Swarovski Crystal Pixies really helped to add a gorgeous shiny glow, and an interesting bumpy 3D effect. Sometimes I wash my hair, and I can feel the crystals on my head – it’s like a scalp massage! (Not kidding) Or maybe I’m biased because I’m loving it so much. Really enjoyed my manicure session with Janelle from Nailbuddies. 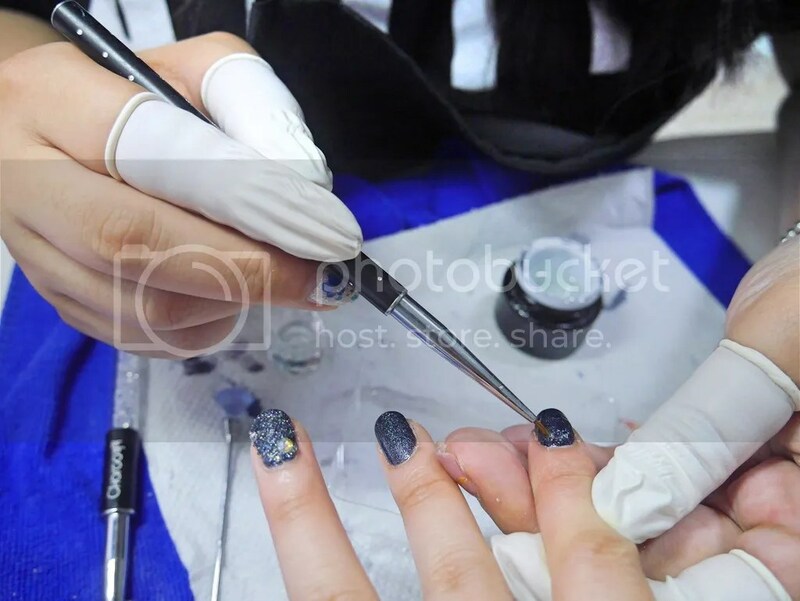 Learnt from her many tips and tricks that she willingly shares, which include: a manicure must always end with capping the outer edges with a layer of finish! Also, if topping up your manicure with Swarovski Crystal Pixies, you don’t actually need a top coat. Her skills with the crystals are amazing and if you have never tried the Swarovski Crystal Pixies, I strongly encourage you to. She’s available at @nailbuddies on Instagram and Vanitee app! It’s super easy to book a session from Vanitee! There are beauty offers from nails, hair, brow and lash, makeup and hairstyling and facial treatments uploaded daily from over 1,700 beauty salons! 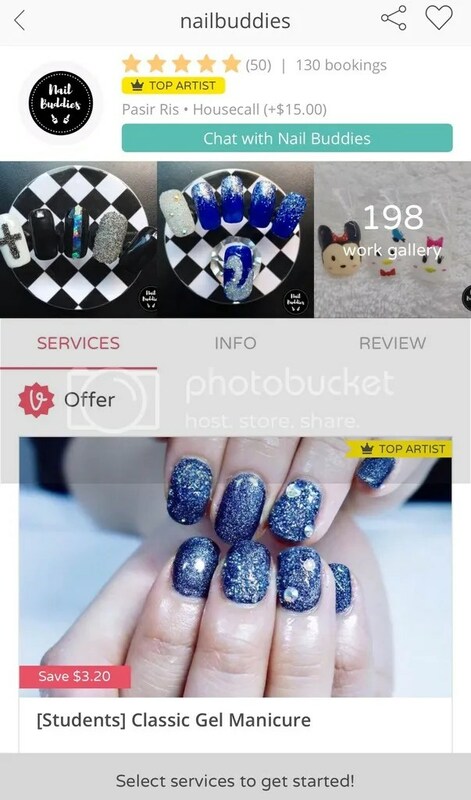 It’s truly Singapore’s #1 app for booking beauty services. And conveniently, you can also see customer reviews and view the artists’ portfolios on the app itself, by simply clicking on their profiles! And as I mentioned, you get to chat direct with the artist, so you can get your requests way in advance. Like for my session, Janelle checked with me way in advance the type of design I wanted. Sounds good right? On top of that, you can earn rewards from booking on the app too! Sign up with my link <<viktol1>> and get $15 OFF any beauty services! Download the Vanitee app now from www.vanitee.com! When you click “Portfolio”, you get to view photos of the work that she has done for her past clients. 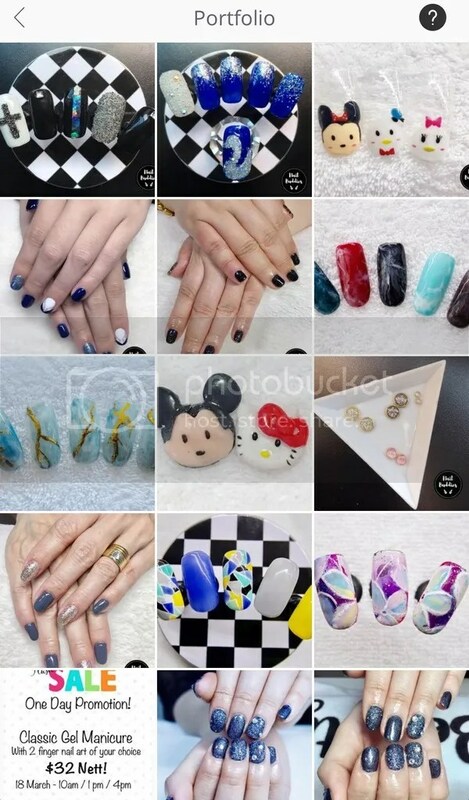 That’s right – she does Tsum Tsum nail art! Under reviews, you can also view what others have said about your artist. 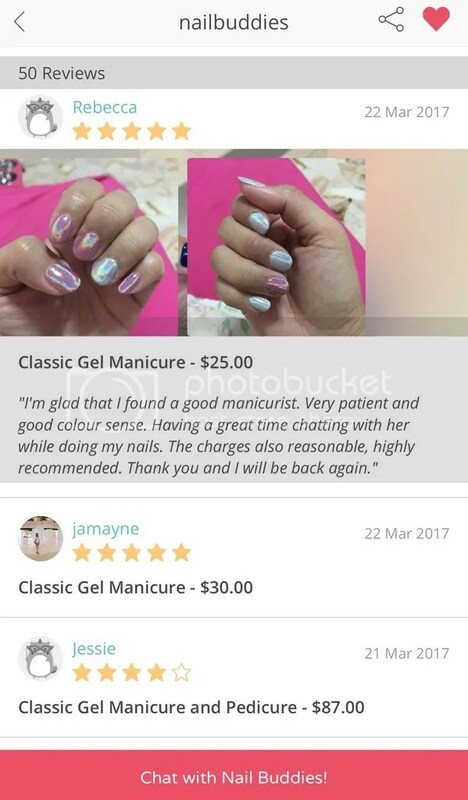 I gave Janelle an honest review, with some pictures for reference. You can view it on her page! 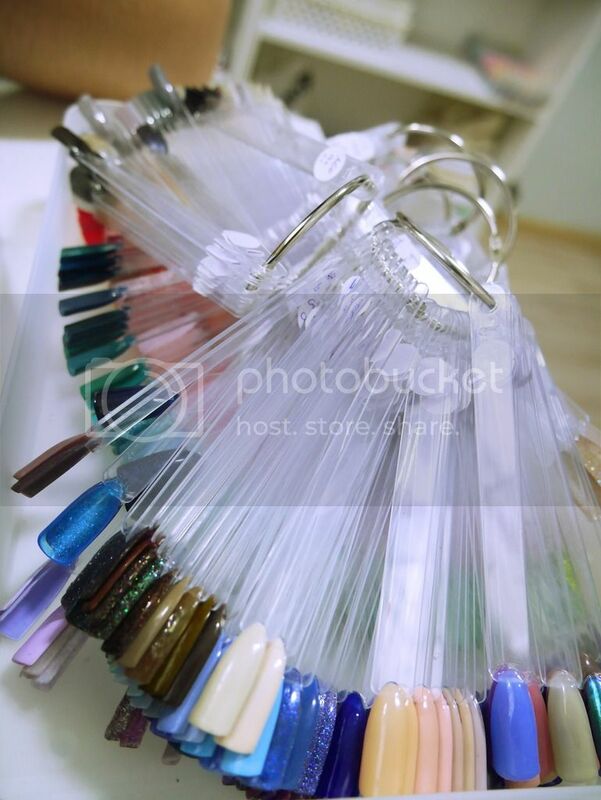 Looking forward to my next manicure session, and to try new patterns using the Swarovski Crystal Pixies. 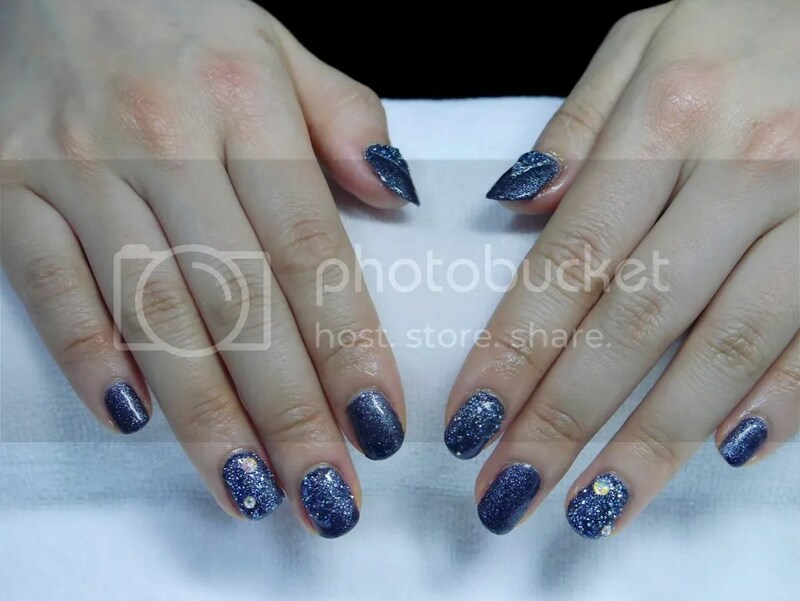 Have already booked my next session with Nailbuddies! We really did this on impulse, after just 2 short and sweet sessions. Sentimental for this final product because I took all night and a day to sift through cuts and piece this one together. Not perfect – but it’s my best. Hope I did justice to my fellow dancers’ efforts – promise you guys I’ll do a better job next time! Psst…More videos over at TheOfficialSsenze’s YouTube channel. For more daily updates, we are also on Instagram. This song was originally sang by Gugudan (구구단). In any case, we loved both Mina Myoung’s choreography and Suzy’s stage choreography so we mashed them up a little. Psst…follow us on Instagram for more! This song was originally sang by Suzy.